Diaper bags come in different sizes, styles, and brands. With hundreds of choices, identifying a good diaper bag can be difficult. So, here’s a review of a best-selling diaper bag: the Bag Nation Diaper Bag Backpack. What makes it stand out among other diaper bags? The Bag Nation Diaper Bag comes in a classy, grey colored style that can look good with any outfit. This diaper bag weighs 2.4 pounds which stays lightweight when filled with baby stuff. It has dimensions of 14.6 x 4.5 x 11.1 inches. There are many diaper bags on the market that you can consider. But with the Bag Nation Diaper Bag, you can carry all you need when going out with your baby. More than that, it comes with many advantages. Does this diaper bag have any flaw? Find out below. A diaper bag is one of the last priorities of an expecting mother. But once the baby arrives, a diaper bag is very convenient especially when on the go with your baby. It stores everything a baby needs such as milk bottles, clothes, diapers, wipes, changing mat, and towel. It is a lot better than a regular purse or backpack. A diaper bag is made of waterproof materials and is easy to clean. It has comfortable shoulder straps that keep your hands free. Some have stroller straps, others come with a changing mat, but the Bag Nation Diaper Bag has it all. It has stroller straps, changing mat, and even a sundry bag. The Bag Nation Diaper Bag is made of premium water-resistant materials, strong zippers, and non-fraying stitching. It is very spacious and has 14 pockets. The straps are large and comfortable. It makes going out with baby much less of a hassle. 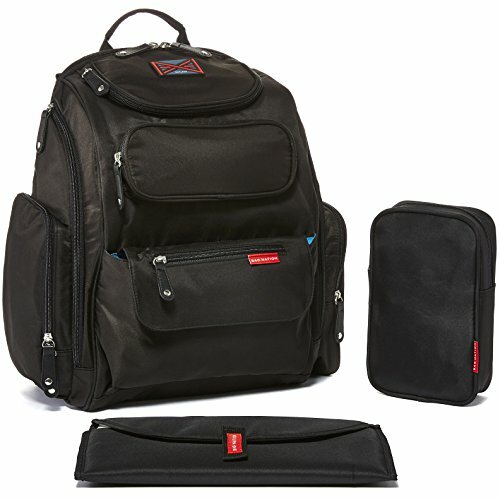 This Bag Nation Diaper Bag Backpack might be a bit more expensive than other brands, but if you check on the quality and comfort, it’s worth it. It also has a lifetime warranty, proof that Bag Nation is confident of its product.